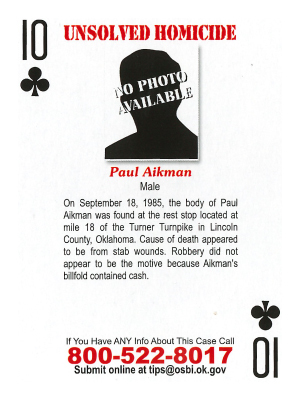 On September 18, 1985, the body of Paul Aikman was found at the rest stop located at mile 18 of the Turner Turnpike in Lincoln County, Oklahoma. The cause of death appeared to be from stab wounds. Robbery did not appear to be the motive because Aikman's billfold contained cash.